I am very fortunate to be living in beautiful County Waterford in Ireland. Of course I don’t feel fortunate all of the time. Just like growing up in the beautiful city of Edinburgh, I didn’t really appreciate it until I left. So it takes little reminders every now and then, away from everyday life, to regain that sense of appreciation. Like some of the spectacular sunsets we’ve had in the past few months. Glowing red, orange and pink clouds on a background of vivid blue stretching across the nearby estuary and surrounded by black silhouetted mountains. Then only a very short drive into the countryside to be immersed in fields. Although, a lot of fields look like no more than a lot of fields, until one day something big and pink is seen sitting in them.…….. Pink, big, plastic and sticking out like the proverbial thumb does not really sit well with me in green serenity! However, it is all to do with a very good cause. The big pinkies are not so alien. 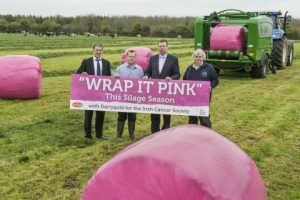 Usually in black plastic these are bales of silage and wrapping the harvested grass in pink wrap is raising money for breast cancer research. 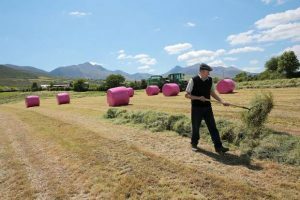 During its launch year of 2015, the breast cancer awareness and fund raising campaign raised £10,000 in the UK from the contributions from farmers alone. In a piece from the Irish Independent, where I copied the photo of the farmer in the field, by December 2016, Irish farmers and contributions from the dairy company Dairygold raised €17,500. True to the theme of this blog, the big pinkies started me wondering about what happens to the moisture in the grass when completely wrapped up plastic. Just like any material in a sealed container, an equilibrium will be created between the moisture in the material and the moisture in the air. I talk more about this equilibrium of moisture in Chapter 3 of my eBook, A Wet Look At Climate Change. Many times on Moisture Matters I’ve talked about high levels of moisture allowing fungi to grow. At very high humidity inside the plastic bag, both spoilage moulds and bacteria with thrive. So why is storage of silage for winter feeding not harmful to cattle? In my search for an answer to this spoilage question, I discovered the whole process of harvesting, bagging and storage of cut grass for silage is controlled based on moisture. And it is not microbes that are the main concern. Complex chemical processes are involved when grass is cut. Timing of when to cut and when to bag to make silage are crucial in maintaining the nutritional value of the grass. Naturally, you’d think the farmers pick a dry day, go out into the field, cut the grass and bag it up as quickly as possible. Not so. If you’ve travelled through the countryside and seen fields of cut grass lying in rows, have you wondered why? Did the farmer just think “job done for the day, I’ll pick that lot up later”? Did it get too dark to work the field? The answer is neither of these, or any other trivial reason. Leaving the grass to lie in the field is deliberate. How long the grass is left depends of course on my favourite topic, MOISTURE! I confess that it was not a drive in our beautiful Waterford countryside that gave me inspiration for researching moisture in silage. A twitter post I received from following @GlanbiaAgri read “FREE Silage Tests in 26 Glanbia Branches” and in the short text mentioned NIR. Now, I know that NIR is the abbreviation for Near Infra-Red. I also know that NIR can be used for measuring, you’ve guessed it, MOISTURE! Following up on this lead, I googled silage analysis and included moisture. One of the first pages I found had the title “Interpretation of Grass Silage Analysis” posted by agritrading.ie. Would you believe it, the very first item of analysis listed on the page is “Dry Matter (DM)”. To get DM, one has to remove all the water from the sample and work out what percentage of the sample being tested is water. Ironically NIR does not give a direct result for DM. Technically, NIR in the way it is used for silage testing can only detect low amounts of moisture. To maintain its nutritional value for cattle, the silage moisture content should be in the range 30% to 45%, which is at least twice the level that NIR can accurately measure. Where NIR analysis benefits the farmer is it gives a rapid result for Total Digestible Nutrients using a hand-held instrument. This makes it possible for the farmer to do analysis without having to send samples to a chemistry laboratory. More samples can be tested reducing error margin and farmers can easily track the condition of their stored silage over time. Every pink bail (and other colours of course) can be individually tested for the right time to use as feedstuff for their cattle. To finish and come back to my moisture theme, the farmer in the hay field above is letting the cut grass “wilt” before bailing. Wilting reduces moisture in the grass and it is important to get the moisture level correct before bailing. Grass is a living organism and like any other living creature, as soon as it is deprived of its source of nutrition and water through being cut off from its roots, it begins to decay. The plant’s cells begin to lose their nutritional value as they begin to die, which of course is something the farmer wants to keep to minimum. However, wilting is needed to start the production of Total Digestible Nutrients from breakdown of the plant fibres. Initially an increase in acid levels occurs when the grass is laying out in the field and these acids prevent growth of harmful bacteria. Fermentation by “good” microorganisms, such as lactobacillus (recognise that one? ), occurs in the bale to breakdown plant fibre and that needs the right level of moisture. This link to a simple active infographic from Pennsylvania State University shows the different stages in silage making. 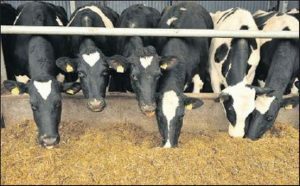 Along with many other factors, a delicate balancing act of moisture levels is needed by farmers to optimise silage as winter feed for their cattle. If you would like to hear more about moisture in everyday life, please sign up for email alerts of my blogs. This entry was posted in My Moisture Food and tagged Cancer, Cattle Feed, Moisture, NIR, Pink Bales, Silage on March 16, 2017 by PeterMoir.